My love for all animals is what sparked me to enter the wonderful world of pet care. I have worked with animals basically all of my life. One of my sister's favorite stories of me as a young child is that I was riding a bicycle with a chipmunk on my shoulder. My mother yelled, "Get that thing off your shoulder before it bites you." I said, "It's not gonna bite me Momma it's sick and I'm gonna help it." I am a proud veteran of the United States Army. I retired from State Government, with 27 years to the day, in February 2017, and will focus the rest of my life entirely around making the world a better place for animals. I understand the importance of trusting someone to care for your "babies". I have always had a household of furry friends. Many people thought I was crazy for having so many pets, but I couldn't imagine my life without them. They bring so much joy. I am dedicated to the prevention of cruelty to, and the alleviation of fear, pain and suffering in ALL animals. I am also a big advocate for spay and neuter in ALL domestic pets. Over the past several years, I have put many hours into TNR (Trap-Neuter-Release) in Franklin County, Kentucky. I help people find affordable resources to spay/neuter their pets, find assistance in providing food and necessary items for pet owners that cannot afford them. This is so much more than a business for me. It is my heart, it is my passion. 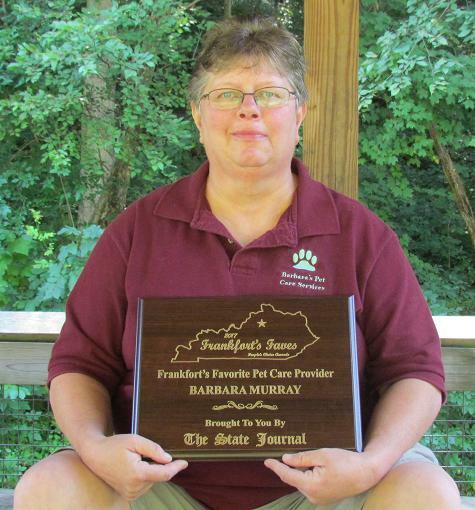 PS: At the end of July 2017, my business was chosen as Frankfort's Favorite Pet Care Provider in the State-Journal Frankfort's Faves People's Choice Awards. I'm pictured above holding the plaque I received. Thank you Frankfort for this honor and recognition. It's much appreciated.